HAM foorum • Vaata teemat - Õhupallid Euroopast - kõrvad lahti! Teema pealkiri: Re: Õhupallid Euroopast - kõrvad lahti! Another balloon alert after a while. 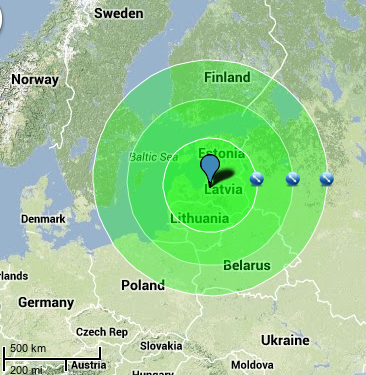 On its third "orbit" around the world, tomorrow evening/night B-64 will fly over Latvia and Estonia. B-64 was launched by Leo Bodnar, M0XER, from the United Kingdom on July 12th, since then it has completed two laps around the world. Right now it is over Silverstone, its launch site. It will come into our receiving range around 7-8 pm tomorrow (August 23rd). On its second circumnavigation it went from Canada to the North Pole and passed it at approximately just 12 km distance, then went back to Iceland. It stores five days worth of history in its memory, and retransmits it as compressed APRS comment, which can then be glued together and decoded, to find out where it has been when it was out of range. This is one of the three balloons that have traveled around the world recently, but those other balloons (B-63 and B-66) are MIA right now. If you have any questions or just curious about anything HAB-related, come join us on #highaltitude on Freenode IRC for a chat! We're planning a HAB launch this Sunday from Latvia. It will be a regular up-and-down flight. Launch will be around 11:00 EEST / 08:00 UTC. There will be three trackers. RASA (dew) - RPi transmitting SSDV over 300 baud RTTY on 434.650 MHz USB. LAASE and LAASE-B (blob, driblet) - backup trackers, 50 baud RTTY, 434.073 & 434.600 MHz USB. Transmitters may experience some drift with the temperature changes. This is a joint launch with the local observatory folks, they have provided some science payload. If all goes well, we'll be live streaming from the launch site. For 300 baud RTTY you will need to increase the "receive filter bandwidth" in RTTY's settings, it won't decode with the default value. Right-click on the lower left corner of the dl-fldigi program and adjust to 300-400. You can see your own received SSDV pictures under View -> SSDV RX. As always, don't hesitate to join #highaltitude on Freenode IRC for updates and just a general chat. Start on varsti, kõrvad kikki! Väike helinäide kah - just sellel ajal pall lõhkes. Sellele järgnev saatja laskumine annab signaalis mõista QSB näol. Kuulsin läänemaal(KO18WX) ka teise korruse aknast 7-el yagiga kuni kukkus 10 km kanti,siis jäi liiga nõrgaks. Many thanks to those who listened to our trackers and sent the telemetry along with SSDV pictures to the main server – ES8TJM, ES5NHC and ES2KO! Our signals yesterday seemed more challenging and unstable than we wanted to.. Launch went pretty much as planned and actually on time for a change, that was the easiest part. We saw the balloon ascending to 5-6 km altitude, when we had to finally start moving. Chase was as usual (for us) - occasionally without the internets, getting lost a bit, choosing the wrong roads etc. But it was fun anyway. Recovery wasnt't as easy as on our previous launches. Payload train landed in a very high tree (sigh) in a swampy forest (sigh) in a very remote area (sigh). Only the parachute can be seen from the ground. We haven't abandoned hope, though, recovery is still in process. RASA was a RaspberryPi with PiCam, Radiometrix NTX2 transmitter and Ublox GPS module, powered by 4xAA. It took full-sized photos, occasionally some videos, too, while transmitting telemetry and smaller SSDV pictures. When we'll get it back, perhaps it will help explain why part of the pictures were tinted green, maybe there is some pattern. 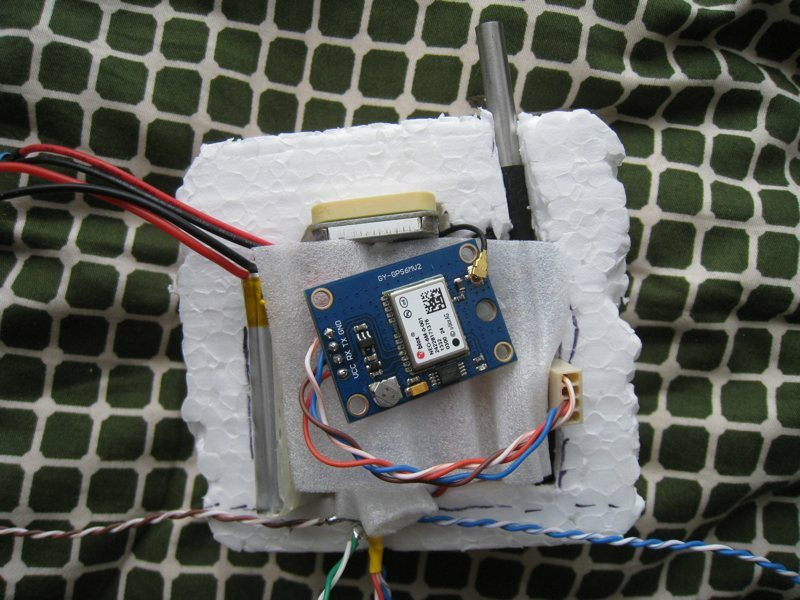 LAASE-B was an Arduino Pro clone with HopeRF RFM22B transmitter and Ublox GPS module, LiPo battery, packed in a small styrofoam box, cheap and lightish (90g). 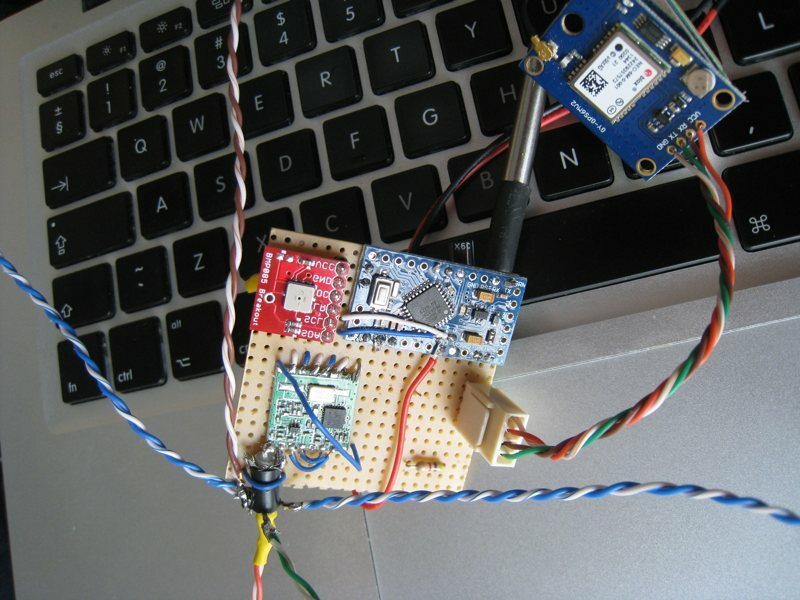 LAASE was a tracker that has flown on our two previous launches - Seeeduino Stalker (Arduino-based) with NTX2 and Ublox GPS, we included it as a backup's backup, if all else fails. Transmitting power for all three was 10 mW as per ISM band rules. Looks like there will be a balloon launch from Latvia tomorrow morning (Friday, April 10). It will be done by Ventspils University College, I'm not involved with them, just passing the information I know, if anybody is able to help them with the tracking as it will be on a workday. Telemetry in standard UKHAS format. Hopefully somebody of their team will post the current status in the UKHAS chatroom, so we would know if and when the balloon is airborne. No need to talk if you don't want to, you're free to just idle there. Thanks for the heads-up, will keep ears open. Õhupall on varustatud 70cm ISM-lainealas saatva raadiosaatja ning mitme sensoriga. 7 bitti sümboli kohta, paarsus puudub, 2 stopp-bitti. Vastuvõtuks sobivad kõik raadiovastuvõtu seadmed, millel on SSB vastuvõtu võimekus. Kõige lihtsam oleks seda teha vast mingisuguse väikese SDR-ipulgaga. Sobivaks tarkvaraks on dl-fldigi: https://ukhas.org.uk/projects:dl-fldigi, sellel lingil on toodud ka õpetus õhupallide signaalide vastuvõtuks ning automaatseks edastamiseks lendude andmebaasi. 7 bits per symbol, no parity, 2 stop-bits. The signal from balloon can be received using any receiver that supports SSB mode. 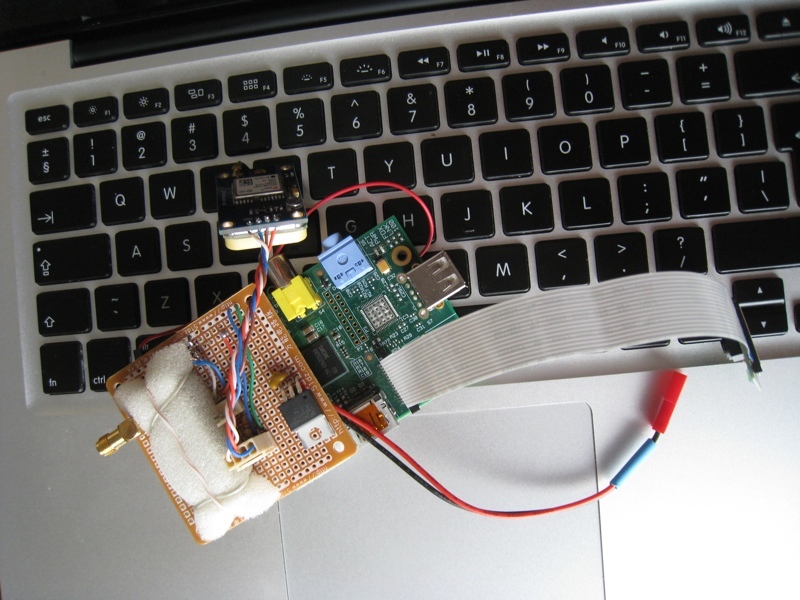 The most appropriate software to decode signal from balloon is a program called dl-fldigi: https://ukhas.org.uk/projects:dl-fldigi. Issanda teed ja atmosfääri õhuvoolud on tundmata,tegi teine ju kena jänesehaagi küll,kuid ilmselt leidis lõpu Lämmijärve VF osas.Minulkadus ta eetrist 14.13 UTC.Millal sinul,Valeri? Laupäeval, 23. mail 2015 saadavad Viljandi noored stratosfääri poole õhupalli, mis kannab kaasas endaga maailma esimest teadusteatrites populaarset katset Elevandi Hambapasta. Kui tükki küljest ei võta, võib märku anda ka meile, kes püüdmas on, et oleks endal turvaline tunne - Ida-Virumaal oleks hädasti vaja abilisi kuna paistab, et payload maandub sinna. Inglisekeelne versioon - palun levitada Soome, Läti ja Venemaa amatööride seas, ehk tulevad ka appi! On Saturday, the 23-rd of May, a balloon heading towards the stratosphere will be launched by the youth of Viljandi. The balloon has a payload containing the popular science theatre experiment Elephant’s Toothpaste. The balloon is scheduled to be launched on midday (09:00 UTC) from the Kikka golf course near Viljandi (58.397193 25.640477 / https://goo.gl/puFvry).